Part II – continued from…….. It is by looking back that one can detect how coming events had cast their shadows across the political landscape in Sri Lanka on the first Independence Day. In the previous article I showed how the two major events that was staged on the Galle Face end of the city on the first Independence Day – 1. the joint rally of the Marxists at Galle Face Green and 2. the official Independence Day celebrations at Temple Trees”, the residence of the first Prime Minister of Ceylon (as it was known then) — foreshadowed the class war” that raged in the south. The Marxist leaders dominated southern politics with their doctrines of revolutionary politics which, among other things, legitimised violence. They promised that the revolution that was coming round the corner would eliminate poverty and usher in the worker’s paradise. With this promise they launched wave after wave of strikes that took them nowhere. Neither the revolution nor the paradise ever materialised. But they created the ideological environment for the rise of the next generation of Marxists, the fascist JVPers, who resorted to brutal violence in a futile bid to overthrow the capitalist class and replace it with their regime which would have been, if it materialised, another Pol Potist regime. The misguided, angry, frustrated youth, stagnating in pools of unemployment without any upward social mobility, went berserk armed with mainly ideological weapons of destruction. Mercifully, their military adventures were short lived. The force that presided over history saved the nation from the barbarism of the Sinhala Pol Potists. The Tamils of the North were not that fortunate. Jaffna Tamils have been the victims of their own perverse history, starting from Sankili to Prabhakaran. Their misery in the 20-21st century can be traced back to the third event that took place on Independence Day. This mysterious event was never recorded at the time, or even noticed by anyone. This third event turned out to be the most intriguing and sinister. It was the obscure beginning of a movement that grew into menacing proportions over time. It moved stealthily in down-town suburbs of Colombo. It was flying in a car, moving in and out of Bambalapitiya, Wellawatte and Cinnamon Gardens localities. It was so insignificant that no one took any notice of the car or the symbol fluttering on its bonnet. It was only a token protest at the time but, as the subsequent events proved, it contained all the potential to breakout into the most powerful force in the post-independent era. In fact, it developed into the dominant force of the 20th century, pushing the Marxist class war into the margins of history. The car was flying a flag which was not known to the vast majority in the south. Inside the car was Murugeysen Tiruchelvam, who was the then Deputy Solicitor-General, the father of Neelan Tiruchelvam. He was flying the Nandi (Bull) flag, heralding the Tamil separatist movement. (See, Senator Tiruchelvam’s Legacy – p 22, edited by Ram Balasubramanian, Vijitha Yapa Publications., 2007). This was the third event that cast its ominous shadow darkening the remaining days of the 20th century. The Nandi flag flown by Tiruchelvam on the bonnet of car was the initial symbol of Tamils which represented their hopes of regaining their lost kingdom. Velupillai Prabhakaran, rejecting the symbols of his political fathers, abandoned the Nandi symbol and redesigned it with his Tiger flag, imitating the MGM lion. Squatting in the streets of Chennai he dictated his design to a street artist who was paid a few rupees. With his limited imagination Prabhakaran replaced the MGM lion with his snarling tiger, putting his head out of a ring of 33 bullets crossed by two guns with fixed bayonets. It is the most devilish flag of any known civilised community with no redeeming features in it at all to express the humane side of Tamil society. Barbarism is written all over the flag. But what he did not know was that he was predicting his own future in his design. The ring of 33 bullets predicted his own fate : Prabhakaran lasted exactly 33 years. And the Nandi flag of Tiruchelvam too foretold its own future : the movement it unleashed ended in Nandikadal. This ill-fated Tamil movement to establish an Eelam also corresponds to the prediction of Supathidda-muni, a remarkable visitor to the court of Yalpanam”. King Pararajasegaram, respectfully asks the Muni about the future of the Jaffna kingdom. The reply is ominous. He foretold that after the Portuguese, the Dutch and the English return to their countries handing over the government of the whole of Langka”, the Tamils would lose their sovereignty forever. The sovereignty will never again come back to your descendants,” prophesied the Muni. (pp. 27 – 29 – Yalpana Vaipava Malai, or the History of the Kingdom of Jaffna, translated by C. Britto, Asian Educational Services, New Delhi, 1999). Obviously, Tiruchelvam would not have envisaged this turn of events when he was roaming the suburbs of Colombo flying the Nandi flag in his car on Independence Day. Nor was he aware that he was unleashing forces that were going to spin out of the control of the Tamil leadership. It was the hidden force of this obscure, unrecorded and insignificant event that burst out from its confines in Jaffna and, in the following decades, overtook all other competing political movements and dominated national politics. The car in which M. Tiruchelvam flew this Nandi flag rolled down, in due course, from the North like a juggernaut destroying everything in its wake. This unsung flag-flying exercise happened to be the seminal symbol of the most divisive and explosive event that challenged the nation, its identity, sovereignty and territorial integrity. In hindsight it stands out as the leading symbol of the events that were to unfold in its wake with disastrous consequences, mostly to the Jaffna Tamils. Not surprisingly, the first victims of the Northern violence were the fathers who gave birth to it. There are some parallels in the violence that erupted in the north and the south. At its peak the violence of the south and the north reached unmanageable proportions threatening the elected democratic state. In the south the youth took up arms on class warfare” based on economics. In the north the Tamil youth were drawn into a racist war, targeting the Sinhala-south. The racist war declared by the Tamil leadership at Vadukoddai in 1976 eventually, overtook the Marxist revolutionary” movements and emerged as the most brutal of violent movement that plagued the post-independent era. Quite appropriately, in keeping with its ruthlessness, the rather placid image of the sedentary Nandi was replaced by the snarling face of a brutal Tiger. The new symbol of the Tiger helped to maintain the rage. But in the end both flags sank in Nandikadal lagoon. Tiruchelvam’s Nandi Flag going down in Nandikadal is another event that predicted the coming events on Independence Day. Coming events certainly had a way of casting their grim shadows into the future. The ideological forces that propelled southern and northern youth into rebellion point the finger to the political fathers who indoctrinated and directed their children into two divergent paths of violence. The Marxist leaders demonised the capitalist class and the Sinhala youth took up arms to overthrow the ruling elite armed with the kaduwa” — the English language. The Marxist produced children to wage a class warfare and had to face them unexpectedly when they were in the seats of power. Beware of what you wish in the twenties you might get them in the forties, they say. The Tamil leadership, taking on a similar leadership role, spun an ideology of identity politics, filled invariably with hate, targeting the Sinhalese – all which were encapsulated in the Batakotte (Vadukoddai) Resolution of 1976. They demonised the Sinhala-Buddhists – the only ideology on which they survived and thrived in peninsular politics. They produced Tamil children to wage a racist war. Marxists promised a workers’ paradise. The Tamil leadership promised Eelam. The Marxists were hoping to ride on the backs of the helpless workers into a paradise of sahodarayas” who would do all the work and, at the end of the day share all the riches produced by their labour. The ageing Tamil leaders were hoping to ride on the backs of the Tamil youth into the elusive Eelam that was on the other side of Nandikadal which they never crossed. In the end both leaderships discovered, rather late, that they had sowed the seeds of their own destruction. The Muslim and the Indian leaderships were wise. They retained the leadership of their communities in their hands by not resorting to violence. They remained within the non-violent framework which helped them to save their leaderships and their communities. Handing over guns to the youth can backfire and first kill the fathers who promoted violence. Tiruchelvam’s decision to fly the Tamil flag on Independence Day clearly was an act of defiance protesting against the Sinhala government”. But the timing gives the lie to the Tamil claim that it was the anti-Tamil acts of the Sinhala governments” that provoked them to pursue extremist politics. When Tiruchelvam drove out of his car from his residence at Wellawatt-am” – a suburb populated mainly by the Tamils of Jaffna – nothing had changed from the days of the British Empire which provided the Tamils a privileged position in the public service, the only growth industry at the time. His act of raising the flag of Tamils on Independence Day was a determined declaration of anti-Sinhala hate politics which was not instigated by the rise of S. W. R. D. Bandaranaike, or his Sinhala Only Bill of 1956, or even the Citizenship Bill passed by the D. S. Senanayake. None of these political acts had surfaced when he drove out on Independence Day challenging, as it were, the might of the Sinhala state”. It did not augur well for communal harmony. He was flying the flag for divisive politics. There was no valid reason for this anti-Sinhala act because D. S. Senanayake had laid the foundations for multi-ethnic, multi-cultural, multi-party government of rainbow colours with guarantees for the minorities (Section 29 of the Soulbury Constitution) on a sound democratic base of the Westminster model. Besides, G. G. Ponnambalam, the acknowledged leader of the Tamils at the time, was included in the first Cabinet. So what earthly reason was there for Tiruchelvam to fly a divisive communal flag when the constructive and conducive elements were factored in to build a rainbow nation? It was, by far, the best of times for the Tamils and, for that matter all communities. Everything was in its place, as the British left with no change at all to the privileges, powers and perks of the minorities. So why did Tiruchelvam come out flying his Nandi Flag unless it was to signal the anti-Sinhala hate politics of the Tamils. It must be emphasised again that it was done without any provocation from the Sinhala governments”. And shortly after that, within less than two years, S. J.V. Chelvanayakam came out to declare his federal/separate state on December 18, 1949 at the government Clerical Service Union Hall in Maradana. The infant state was taking its first steps when the Tamils launched their racist offensive on bogus accusations of discrimination, denial of Tamil rights that were supposed to end in the extinction of Tamils etc. If Tiruchelvam launched the first Tamil offensive on the very first day of independence with a symbolic act then S. J. V. Chelvanayakam, the father of Tamil separatism, took it to the extreme end of the political spectrum by launching Illankai Tamil Arasu Kachchi (The Federal Freedom Party of the Tamil-speaking People of Ceylon) in 1949. In his presidential speech he picks on four main issues which should be examined in hindsight to test the validity of his accusations. (See full text of his speech in Michael Roberts’ Tamil Person and State, Pictorial, Viitha Yapa). First, he says : The government is indulging in a series of discriminatory legislative and administrative acts too numerous to recapitulate …..Over two years of internal self-government have reduced the Tamil-speaking people to an inferior status in their own country.” Having said that he picks on four issues: 1. de-citizenize half the Tamil people of Ceylon.” 2. the Lion Flag, saying that it is identified with Singhalese sovereignty. He adds that it is symbolic of its attitude towards the Tamil-speaking people. The Government ignores their existence as a part of the body politics”. 3. Government colonisation. We have only the beginning of it in Gal Oya,” he says. 4. the language policy. The government intends to administer seven provinces in Sinhala without making provisions for the use of Tamil in all the nine provinces, he complained. Re 2 : The Lion Flag is symbolic of its (state’s) attitude towards the Tamil-speaking people”. Chelvanayakam was objecting to the Lion as symbol of majoritarian supremacy. He did not object to Tiruchelvam running around with the bull in his flag. But it was highly objectionable for the Sinhalese to have their lion in a multi-ethnic, multi-religious flag. It is this kind of perverse logic that exacerbated inter-ethnic relations. In any case, the overall design of the national flag was signed and endorsed by all community leaders, including G. G. Ponnambalam. The orange strip is for the Tamil and the green is for the Muslims. The Sinhala attitude towards the Tamil-speaking people” was evinced in the distinguish place given to the minorities in the flag. For instance, there are 193 flags flying at the UN. The only flag that has given the Tamils a place is the Sri Lankan flag. Not even India, which has the largest concentration of Tamils, has given a pride of place for the Tamils in their national flag. So how valid is Chelvanayakam’s anti-Sinhala complaint? Re.3 : Government colonisation. The Tamil colonisation of the hill country by the Indian workers, evicting the Sinhala peasants, and the colonisation of the suburbs of Colombo (example : Wellawatta-am”) with government servants from Jaffna were the outcome of state-sponsored jobs created and handed over to recruits of the Indian and Jaffna Tamil communities by the British government. In the hill country the Sinhalese villages were forcibly taken over under the fake Waste Land Act. Overnight the Sinhala villagers became homeless people evicted from their traditional homeland. Chelvanayakam did not object to that. He objects to only Sinhalese settlers going back to their traditional homeland from ancient times in the east and the north. Besides, Gal Oya is now in the hands of the Muslims more than the Sinhalese. Clearly, Chelvanayakam was scare-mongering to push the Sinhalese out and replace them with Tamils. His objective was to increase and consolidate his electoral clout to beat the Sinhalese. Re.4: The language policy. The claim of Chelvanayakam that the Tamil language will disappear and Tamils will be reduced to slaves under Sinhala Only legislation have proved to be absolute bunkum. Tamil language has been given a place in the state as never before. Better than even in India. Take also the case of the Tamil diaspora. They live in various parts of the world. In which of those country has Tamil language a place as in Sri Lanka. Which currency declares its value in Tamil? Which stamp of other countries prints its identity in Tamil? Which international airline announces in Tamil? And yet the Tamils go round demonising the Sinhala state as the enemy of Tamils which had suppressed and denied the Tamils their linguistic rights. From its inception Radio Ceylon, the state run broadcasting institution, (the BBC of Sri Lanka) has been a centre for the promotion of Tamil culture. Chelvanayakam and his team had never stopped talking of discrimination. How far is this true? Consider, for instance, a fundamental issue affecting all communities. Children of all communities are given free education, irrespective of race, religion or caste, from kindergarten to university. Not even Tamil Nadu, the only homeland of Tamils, give free education to the Tamils. I googled fees for a university degree in Chennai. I was shocked. It’s 1 crore for MB,BS. And the Tamils have the gumption to accuse the Sinhala state” of discrimination for giving them free education. It is the doctors who got free education from the Sri Lankan medical faculties who financed the Tiger war, crying discrimination. Tamil humbuggery knows no limit. They are scared to acknowledge the realities because they know that the truth will demolish their claim to be victims of the Sinhala state. Besides, their only means of hiding their brutal persecution, murder, and discrimination against their own people over the ages is by pointing a finger at the Sinhala state. Chelvanayakam complained that the Tamils have been reduced to an inferior status at a time when Sir Kandiah Vaidyanathan was the first Prime Minister’s first Permanent Secretary, the highest position in the public service. Also the first Sri Lankan Army Commander of Independent Sri Lanka was Maj-General Anton Mutucumaru. The second Navy Commander was Rajan Kadiragamar. There were at least four Tamil IGPs. Head of the Treasury was Raju Coomaraswamy, the father of the present head of the Central Bank. The list is unending. Yet the Tamils were made to believe that they are the victims of Sinhala discrimination. Yes, there was discrimination. That is only field in which all Sri Lankans are treated equally without exception. 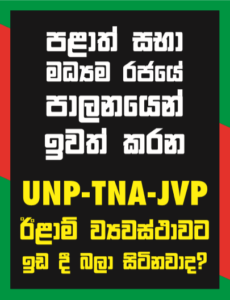 When the UNP wins all the Sinhala SLFPers, are beaten, houses burnt, transferred, demoted, or sacked. And vice versa. Now if that happened to Tamils it would be broadcast as discrimination. It is time that the Tamils faced reality and worked for reconciliation first by apologising to their own people – not the Sinhalese — for the crimes committed against them for centuries. I am sure that if all the crimes committed by the Sinhalese are piled up next to the crimes committed by the Tamil against the Tamils the Sinhala crimes would stand at the level of an ant hill compared to the Himalayan heights of Tamil crimes. Don’t take my word for it. Listen to the words of S. Chandrahasan, son of Chelvanayakam and V. Anandasangaree, one of the last of the Chelvanayakam generation, who have said that Prabhakaran had killed more Tamils than all the others put together. What more evidence is needed to prove that the Tamils have been better off under the Sinhala governments than under centuries of fascist Vellala rule or the Pol Potist regime of Prabhakaran? End of story – a tragic story indeed in which the Tamil crimes against the Tamils, particularly against the Tamil children, make Jaffna the grim black hole of Sri Lankan history.